1996: This was filmed at 17th century Crosskeys Inn up near Toome, and it’s a famous house for music at all hours of the day and night. This short clip is clear evidence that traditional music really does get played during daylight hours, and even outdoors too! 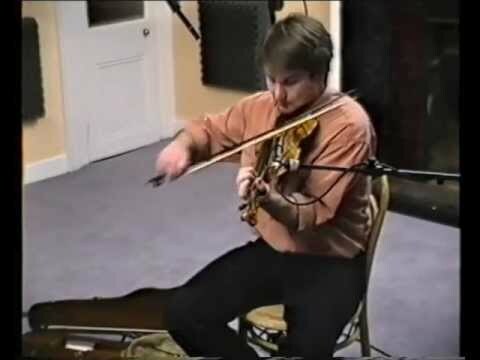 These are two nice Donegal reels, the first of which is called The Scowlin’ Wife and which I learned from the master fiddler Francie Dearg Ó Beirn of Cashel, Kilcar. and the second reel is The Spirits of Wine which I heard played on a fabulous recording of John Doherty that was made by Dr Alun Evans. When we were making the CD The Floating Bow which features selections from Alun’s remarkable collection of recordings of John, we used this reel as the opening track. John’s music is a constant inspiration to me and I love these two reels. 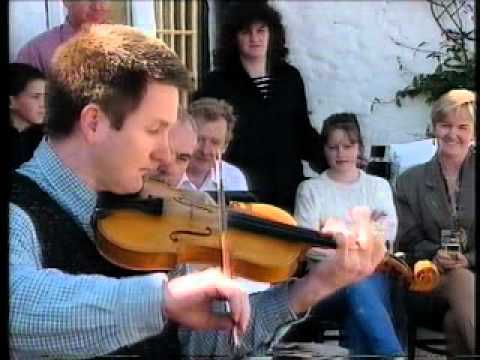 1993: In May 1993 I volunteered to be the ‘guinea pig’ for the new sound and video recording facility at Taisce Cheol Dúchais Éireann/Irish Traditional Music Archive which was then housed in 63 Merrion Square, Dublin, in the upper floors of the Royal Society of Antiquaries of Ireland. I can’t remember how many tunes I played, but I do remember enjoying sitting there playing away to my heart’s content while Nicholas Carolan dealt with all sorts of technical things that I didn’t need to know about! Here’s one of the tunes that I recorded – it’s called The Sporting Belles and it’s a version of a really popular tune called Sporting Nell. The version I play has elements of versions played by John Doherty and James Byrne, two of the greatest musicians I ever encountered, and they are never far from my mind.